Dr Steiner attributed the photo to “the talented @pdecherney” — her colleague at U PEnn, Dr Peter Decherney. When I first saw this image, only the top half was visible on my screen, a fine, and I’m no expert, possibly world renowned, and yes, as Dr Steiner says, stunning mosaic of Christos Pantokrator, Christ the ruler of the universe if I’m not mistaken — and again, I’m no expert, and willing to take instruction. But stunning, yes. Christ, a mosaic, stunning. Art at the service of praise, beauty as a window on the divine, . And then, perhaps an hour later, but lapses of time are mended in this realm, I saw the whole image, sized to fit my screen. — with, brightly lit, even moreso if it were possible than the Christ in mosaic above it is, a small table — an altar, with three priests, and more in the wings, celebrating what looks to be the Eucharist — thought I suppose it might also be Vespers — and again, some expert could say whether the central celebrant is, by his zucchetto or skullcap, a cardinal, bishop, or maybe monsignor. No matter the celebrant’s rank, he is, as celebrant, at the vanishing point — both the central point of attention photographically, and the point where the priest acts in the person of Christ, in persona Christi, thus himself, his persona, vanishing at the vanishing point. Do this in memory of me, Christ said to his disciples at the Last Supper before his crucifixion, in words of sacrifice, previsioning his body about to be broken on the cross the next day — and down the centuries priests have broken bread as he did, speaking his words in his place, Take, eat, this is my body. In the consecration, with these wrds, bread and wine become invisibly the body and blood of Christ, which we may remember, digest and allow to transform us. It is this which makes the celebration of the Eucharist, in Catholic terms, “the source and summit of the Christian life”. 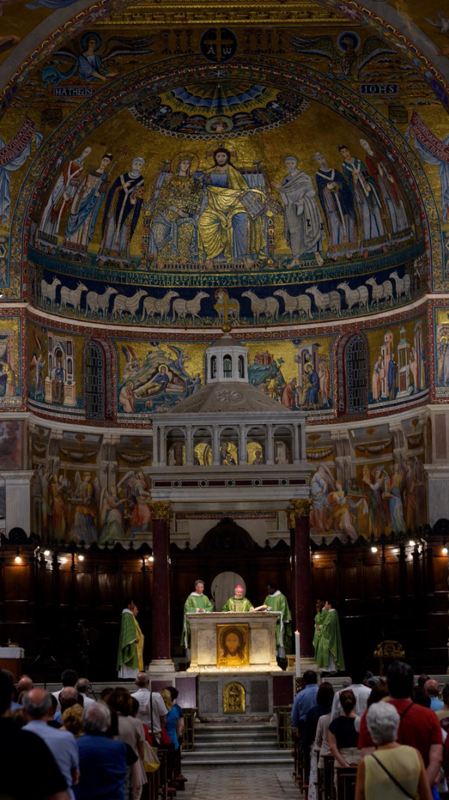 And then, between this focus on the priest celebrant below, and the Christ all-ruling above, there is a mysterious relationship, each reflecting the other as in duet of mirrors — above, below and I invite you to envision, beyond. 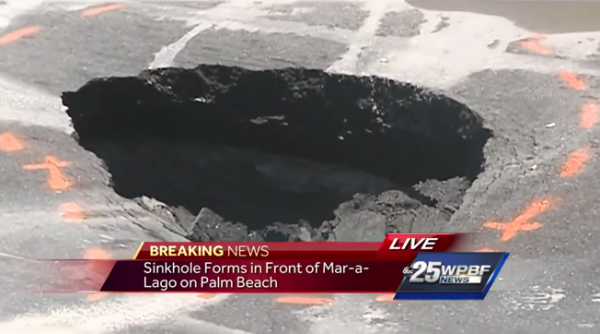 May your Sunday bring you cause for such thanksgiving..
Will Trump ever drain the Sinkhole? Bryan Alexander of Infocult headed his report, Earth opens campaign against Trump. 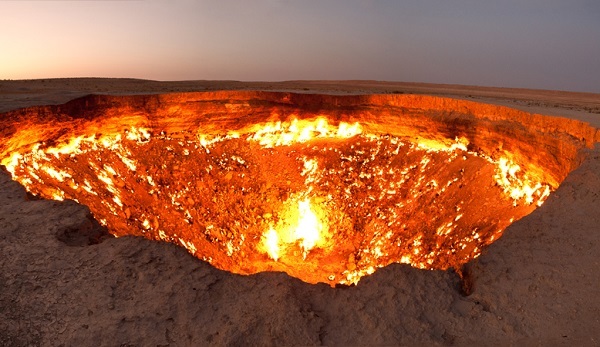 Bryan has been following sinkholes around the globe for some time now, and has also been keeping a wary eye on Donald Trump, so the correlation wouldn’t surprise him, and he leaped to causation, with or without good reason. It’s black, as though part of the world had been redacted for security reasons. Bothing to do with Saruman, I assure you. But take a look at those eyes..
@owillis @Trumpnado2016 The Swamp is draining. 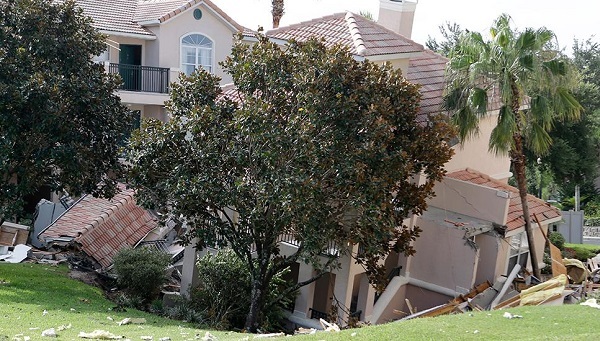 That’s clever, but it doesn’t really explain this photo of the sinkhole alt-event now, does it? What does that orb have to do with counterterrorism, BTW? 2400 years after his trial and execution at the hands of the restored Democracy, Socrates continues to exert a fascination over the Western mind. He is a seminal figure in the development of philosophy and was part of the cognitive revolution in classical Greece that saw a shift from archaic Homeric values to humanistic, rational and proto-scientific values. The death of Socrates, condemned for thought crimes, was the great contradiction of Athenian self-conception of Athens as “the school of Hellas” and his execution remained an indictment leveled by the enemies of democracy ever since. 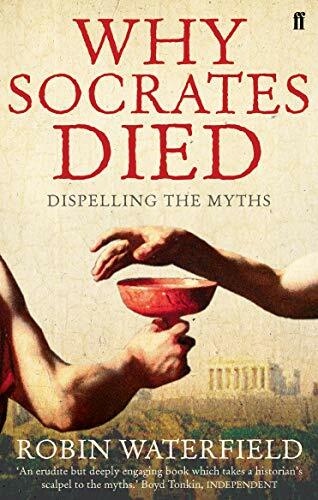 While the importance of Socrates is universally acknowledged, the exact circumstances and motives for his death remain obscure; ironically, a philosopher who so deeply valued “truth” had prosecutors and apologists equally determined to conceal or distort it. 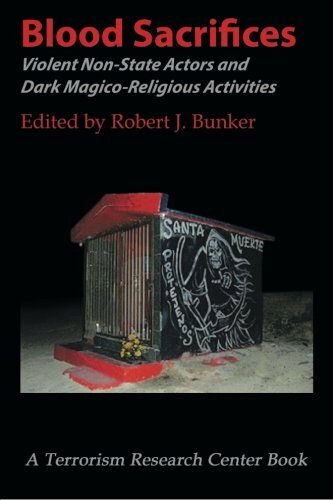 British scholar and translator Robin Waterfield has attempted, as did radical journalist I.F. Stone a generation earlier, to unearth the truth behind the myths about Socrates. Unlike Stone, Waterfield’s investigation, Why Socrates Died , rests on an extensive career translating and writing about the classics, including the major primary and secondary sources used for his book. This provides a firmer base for the inevitable speculation from limited evidence that is frequently required in historical reasoning about antiquity. Waterfield is also far less influenced by contemporary political and cultural conflicts than was Stone, whose turbulent career as an investigative journalist was intertwined with Cold War controversies and his activities on behalf of the intelligence services of the Soviet Union. Waterfield also understands far better the machinery of the Athenian state and the nature of Greek polytheistic religious life, which Stone erroneously believed had become thoroughly secularized by the time of the trial of Socrates. ….Both Plato and Xenophon wanted to give their readers the impression that a high-minded philosopher was convicted by the stupidity of the mob, but this was an attempt to distract attention from the real reasons Socrates was killed. The real reason posited by Waterfield was that Socrates was the teacher of Alcibiades and Critias and thus bore some responsibility for the grave misfortunes suffered by Athens during the war and the crimes of the Thirty Tyrants afterwards. Moreover, as Waterfield argues, Socrates was not so much the victim of a political show trial in which Socrates deliberately provoked the democratic faction to kill him, as I.F. Stone argued but was a religious sacrifice or scapegoat for the transgressions of his students against democracy so that a fragile Athenian society could heal its wounds. Much of the book is devoted to the career of the mercurial and highly charismatic Alcibiades, who entered politics young and as a disciple of Socrates. According to Wakefield, A scion of the greatest of Athenian houses, Alcibiades in his person was emblematic of all of the virtues and vices of the old Athenian aristocracy that had once ruled Athens from the grand council of the Aeropagus. Of the rising generation of young and clever men of good breeding who aimed to play a role in the politics of the radical democracy, Alcibiades had the greatest promise. Highly intelligent, wealthy, handsome and with a magnetic charm, Alcibiades had the natural arête and metis to romance the mob and bend it to his will. It was this that Waterfield argues attracted the attention of Socrates, who saw in Alcibiades and other young men of promising talent he took on as students the future of Athens. Unfortunately, with Alcibiades, his numerous gifts could never be separated from his equally stupendous flaws – sexual libertinism, flamboyant profligacy, megalomaniacal ambition and reckless hubris – that were frequently his undoing. A psychological chameleon and demagogue, Waterfield argues that the Athenians, as much as they repeatedly forgave and embraced Alcibiades and his schemes, ultimately feared him as an aspiring tyrant. This feeling crystallized into blame for Socrates in the public mind when other students of his who lacked the charms of Alcibiades, notably Critias, sought revolution and oligarchy. Critias’ bloodthirsty pro-Spartan regime as well as the elite’s prior attempt at oligarchy are explained but not with the same space and attention to detail devoted to Alcibiades. One point that Waterfield takes further than most is arguing that Critias aspirations for a morally reformed and less populated Athens are very much in line with the teachings of Socrates. That far from an aberration for whom Socrates bears little responsibility, Critias represented the philosopher’s hopes for Athens and the Athenian democrats who had suffered at the hands of the Thirty Tyrants wanted someone held accountable. That someone was Socrates, whose teachings as it were, would imperil democracy again were he left at liberty. Waterfield’s handling of the trial itself is less satisfying and includes a lengthy foray into fictive speculation of material prejudicial to Socrates that his notable apologists, Plato and Xenophon, have carefully omitted from their elegies to their beloved master and his trial. The parallels between Athenian religious ceremony and the results of Socrates trial – a trial for impiety held in defiance of the general amnesty that had been decreed for actions under previous regimes – are present. The Greeks did not as a rule go in for human sacrifices in the classical era (though it wasn’t quite as unknown as is commonly believed) but the symmetry is present if more metaphorical than perhaps explicitly religious. It is difficult as a modern to game out exactly where matters of state end and religion begin when the religion is pagan and intertwined in the mind of Athenians with the fate of the state. A debate more for classical scholars than the average layman. What is difficult to dispute is the centrality of Socrates life in the evolution of Western philosophy and the contradiction he presents for admirers of self-government and free speech and thought as the core of a liberal society. Socrates elenchus is radically subversive; his Homeric tenets on rulership were arch-reactionary even by the standards of his day and Socrates devotion to his beliefs could not be dented even when they required the supreme sacrifice. What would an American Socrates look and sound like today? How would “the herd” react to his immovable defiance of popular ideologies? Judging by the barometer of social media and the lynch mob mentalities and angry censoriousness that prevail in elite quarters of American life, I’d have to say: poorly. I see no evidence that Americans living in the bastion of civil liberty would prove more tolerant of dissent than did the Athenian democrats who put Socrates to death. Waterfield has written a lively and informative explanation of a philosopher whose execution casts a long shadow even after two thousand years. Recommended.